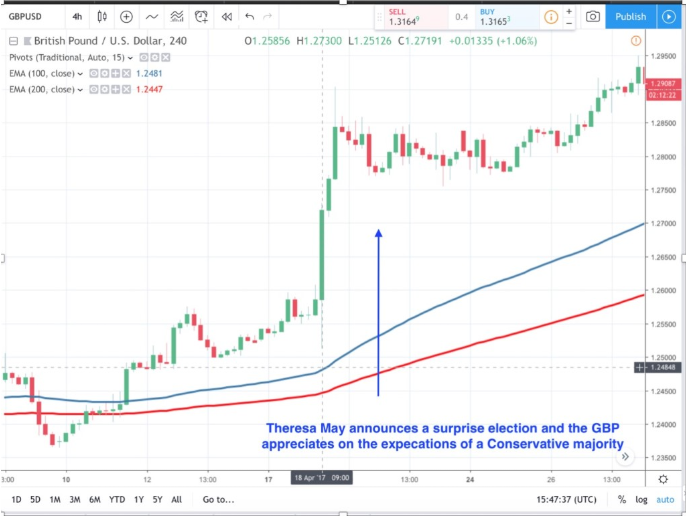 The reason for the Pound's rise was because it was thought that Theresa May would gain a further conservative majority in the House of Commons. This was thought to strengthen the conservatives' hands for any upcoming Brexit negotiations and potential legislation. One of the key aspects to this trade working so effectively was that it was a 'surprise announcement'. The general rule of thumb is this: the greater the surprise, the greater the market reaction. There is another hidden trade that emerges in the 'before the election' section and that is as influential polls are released. A political poll is viewed as a key indicator for the outcome of any election result, so a shift in the poll numbers will result in a shift in price too. These polls being announced provide tradable headlines on an intraday basis. A good example of this was seen out of New Zealand in September 2017 just after 0600GMT when New Zealand's national party was reported to have increased its lead over the Labour opposition. 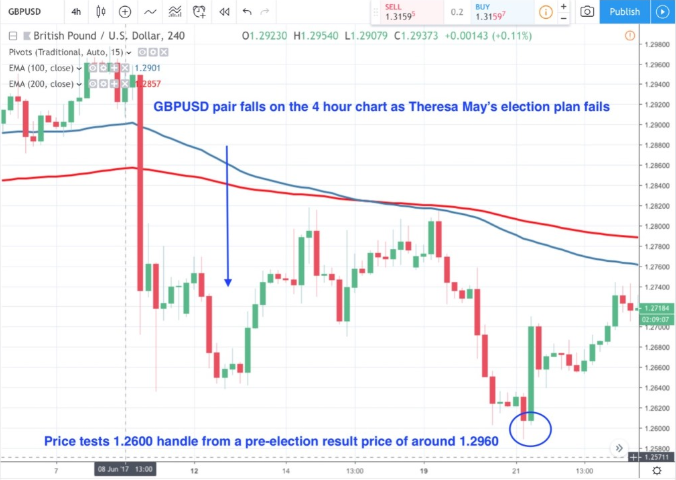 The other key area for traders to profit from is the market's reaction after the election results have been announced. This was illustrated by the US elections when Donald Trump's US election win was announced in November 2016. There was an extremely volatile reaction in the USD/JPY. It dropped several hundred points on the announcement initially. This was because it was feared that Trump's presidency would be antagonistic to China and his protectionist policies would produce a riskier global environment. The key driver for the USD/JPY strength had been that the expectations for the Federal Reserve to hike rates had gone from around 40% to over 70%. The market suddenly saw that Trump's corporate tax cuts and US business friendly policies and infrastructure investment would result in a positive US dollar environment. It should be noted though that elections also provide excellent trading opportunities and do not need to be feared. 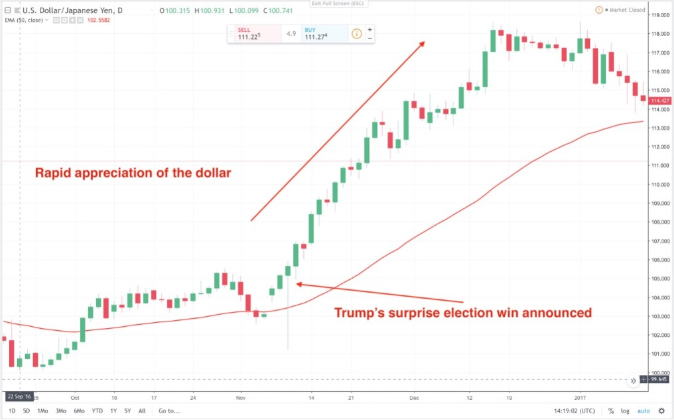 In the USD/JPY example the initial market reaction was reversed as the market digested Trump's win, so you need to be aware that even market expectations can be wrong. Don't marry your positions and keep an open mind and, more importantly, a stop in place.